Today I'm going share my first recipe, which I've made in my new Preethi Touch, 6ltr. Electric Pressure Cooker. I was unwell since last month, so could not able to upload any new recipes on my blog. But now I'm doing better, so thought of making some special dish in my Preethi Touch, 6ltr. Electric Pressure Cooker. Today I'll share a rice item which can be easily cooked in this Preethi Touch, 6ltr. Electric Pressure Cooker. 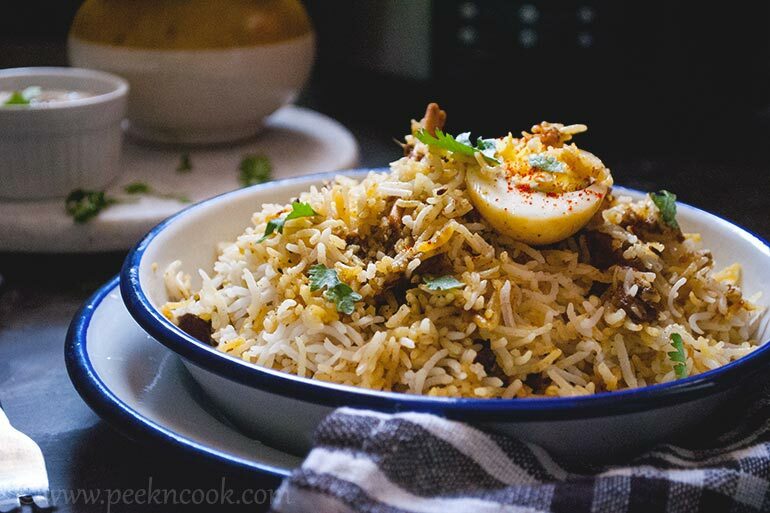 Mutton pulao is a flavorful, easy to make one pot meal, which is a combination of fine basmati rice, medium chunks of pre boiled mutton pieces, and lots of spices. This dish is easily available in many Arabian restaurants in Hyderabad, but I wish to prepare any mutton dish at home, as I'm concerned about the hygiene part. In this dish, pre boiled succulent meat pieces are cooked along with basmati rice, whole spices and curd based gravy. If you have surprise guests at home, and you don't want to order from restaurant, go for it. It takes only 1 hour from start to end. And after having such yummilicious dish, your guests going to praise you. And my new Preethi Touch Electric Pressure Cooker made my job even easier. So let's check for the recipe. Mutton pulao is a flavorful, easy to make one pot meal, which is a combination of fine basmati rice, medium chunks of pre boiled mutton pieces, and lots of spices. Take the meat, wash under tap water to remove any hair and unwanted part. Pat dry and keep in the Preethi Electric Pressure Cooker. Now add all the ingredients mentioned under the heading of Yakhni/Meat Stock. Add enough water and close the lid, and swich to the 'meat' mode. After the timer indicates OH, release the pressure and open the lid. Now take the meat from the yakhni and put on a bowl, strain and pour the yakhni in a seperate bowl. Now Turn the cooker on saute mode. Heat the oil and ghee in it, add sliced onion and keep frying till nicely golden brown. Add the boiled mutton pieces to the cooker, and saute on high heat for 1 to 2 minutes. In the meantime, take the curd in a bowl, add ginger garlic paste, cumin coriander red chili powder and mix well. Add this curd mixture to the cooker and mix well. Cook for sometime and then add the soaked rice to the cooker, along with 2 chilis, salt, mint and saffron soaked milk. Now measure the yakhni, which should be 5 cups, if less then add water for the rest. The liquid must be 5 cups in total. Now switch on the cooker to 'Rice' mode. When the cooking is done, the cooker will go to keep warm mode automatically. Release the pressure and open the lid. Serve hot Mutton pulao by garnishing with chopped cilantro along with raita. Or you can keep the pulao on warm mode to serve it when guests will arrive. Serve mutton pulao with cucumber salad and raita. You don't need any side dish with such delicious dish. If you don't have electric pressure cooker, you can cook this dish in normal pressure cooker too, Same as the electric pressure cooker, just cook the last step on high heat up to 2 whistles.